On Sunday afternoon 26 April five armed and mounted men clattered down the main street of Waiuku. Ref: Bruce Ringer, Outside the Kentish Hotel, Waiuku, 2015. The occasion was not a bank robbery nor a gymkhana but a reenactment, 101 years after the event, of a locally famous photograph taken of the first volunteers to leave Waiuku for active service during the First World War. Ref: Volunteers, Waiuku, August 1914, photograph reproduced courtesy of Waiuku Museum Society, South Auckland Research Centre, Auckland Libraries, Footprints 04686. 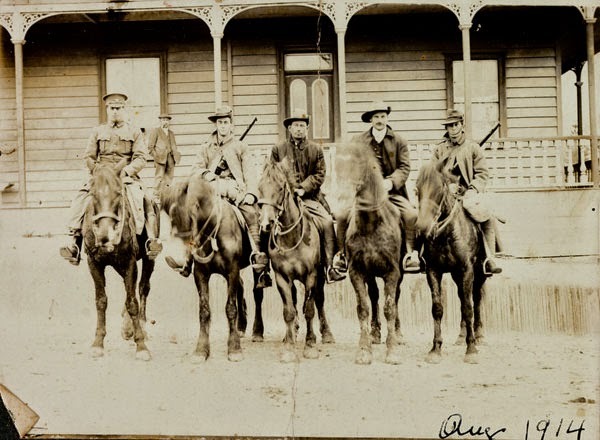 These five men posed on their horses outside the Kentish Hotel on 17 August 1914. Captain John Henry Herrold of the Waikato Mounted Rifles is on the far left. He is accompanied by, from left to right, Troopers Frank Knight, Robert William ('Bob') Hammond, Alexander Glass and Henry Eisenhut. If you would like to add to the records of these first five men, you can do so at the Online Cenotaph website or keep an eye out for the Artefact Digitisation Units that are travelling around the region. All five men survived the war, although Frank Knight was wounded at Gallipoli in 1915. Henry Eisenhut was awarded the DCM for gallantry in action at Beersheba, Palestine, in 1917. Captain Herrold (by then Major Herrold) was also wounded, and won the DSO for gallantry in action in Palestine in 1918. Thanks to the generosity of the Waiuku Museum Society we will also shortly be able to release photographs of the four troopers taken at Heliopolis, Egypt, in April 1915, and later in life at an Anzac Day service in Waiuku in 1947.